This relatively small snake is found mainly in and northwest of the Twin Cities area. Although it will bite when threatened, it is not poisonous. True to its name, the brown snake is brown with a lighter-colored stripe down its back and a row of small black spots on each side. It’s only about 9 to 13 inches long; the brown snake is smaller than most Minnesota species. After mating in spring, brown snakes give birth to 3 to 20 babies, each about 4 inches long Brown snakes eat insects, snails, slugs, earthworms, tadpoles, and small frogs. 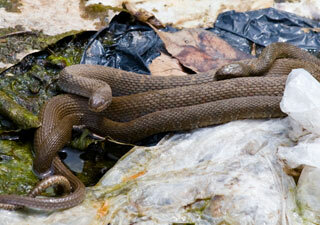 Brown snakes like to hang out in open areas near water and trees. You can also find them on golf courses and in residential areas often taking cover under a board or rock. They spend their winters hibernating in nooks and crannies in rocks and ant mounds.